Despite the fact that the U.S. car manufacturers have been on a roll in recent years, even surpassing most of their European counterparts, there’s one car company, in particular, we haven’t seen a whole lot of. Lincoln. When they announced they would make a big appearance at the New York Auto Show in 2016 we were skeptical, because, well, we haven’t seen anything special for a while. But boy was we wrong and in for a shock. 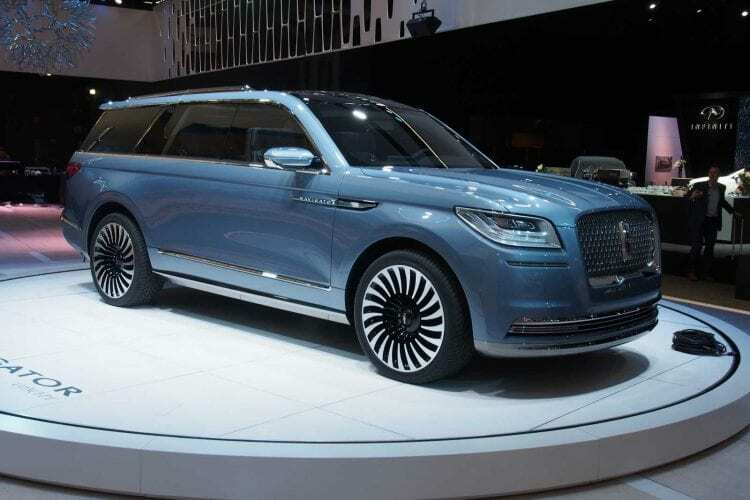 Lincoln brought their Navigator Concept with them, and it proved to be a real show-stopper, but, perhaps more importantly, it showed that there is a bright light in the future of Lincoln should they continue at the pace they are with at with this concept. For starters, we have the biggest noticeable feature, the centrally mounted gullwing doors which are two-doors wide meaning they encompass both rows of seats. The car is physically massive, and we’re talking properly big here. The only thing making it appear smaller than it is, in fact, those big gullwing doors which, because there are only two of them, visually shorten the length of this behemoth. What’s weird is that this concept car doesn’t look that much like a concept. Okay so the big gullwing doors “might” not make it into production (they almost certainly won’t), but there are a lot of hints of features that will make it into the final design and build of the next Navigator. This is great, and we could hear many reviewers approving design and hopes that the U.S. car maker will offer this vehicle. The big doors are a bit of overkill because they are unpractical when you think about it. They might look cool, but we bet they’re heavier than some small cars on sale (not literally), so closing them might be difficult. What’s extremely realistic and production ready is the front end of the Navigator which really does appear as it’s finished. The grille is actually already used in other Lincoln cars, and we can easily recognize the styling and design language of the company. The headlights are very flashy with the LEDs arranged in an L-configuration, and there’s even an LED strip beneath them as a daytime running light maybe. The side of the car is dominated by the large gullwing doors, but there are some nice features in the form of two lines running along from the front of the car to the back. One is below and one above the beltline. The one above is pretty big and narrows down as it edges closer to the rear. The back segment is also looking production-ready. The taillights are actually just a single bar stretching from one side of the rear to the other. The Lincoln logo is located just above that and is very reminiscent of the way the Land Rover does it. The bumper is swept up, and it’s the only feature that sticks out and is looking out of place in the otherwise handsome concept. 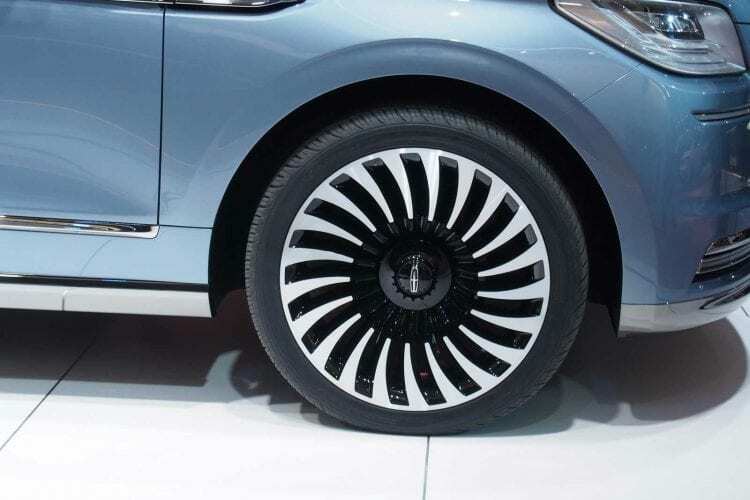 The wheels appear to be 24-inch, but we’re not sure about that, this will also be downsized for the production-ready vehicle. The exterior may be production-ready, but it appears the design team has been given more freedom for the interior. It’s not that it isn’t production ready, but there are some features which are purely aesthetic since it’s obvious they wouldn’t work in the real world. Getting into the cabin, you immediately realize that the reason for the delivery of the gullwing doors was to allow Lincoln to showcase the interior study along with the exterior. With a large luxury SUV, the most desired characteristics are obviously luxury and space. The 2018 Lincoln Navigator Concept seems to combine them without any issues, although, we’ll see how much of that gets carried over to the road going version later when the standard Navigator gets launched. On the infotainment side, there are touchscreen monitors in the back of the headrests in the first two rows of seats which also have WiFi in them. Don’t worry, the driver and the co-driver haven’t been forgotten because they’ve been given a large floating screen in the front. It displays most of the vital car information and the infotainment options plus it can also be customized with the help of a second digital touchscreen located in the center stack. I think it’s safe to say we’re pretty much covered on the display front. The seats are comfortable, and even the third-row occupant will have enough space. Because this car is so large, headroom and legroom aren’t an issue, even for taller people. The actual comfort of the seats themselves is excellent because they are supportive but soft, and we suspect that the second row is the best place to spend time in. Not a great deal about what’s under the hood has been released since all we know is that a 3.5 liter EcoBoost V6 will be powering this giant. It should develop somewhere in the region of 400 hp and a lot of torque, how much exactly is still anyone’s guess. The current Lincoln Continental has a twin-turbo 3.0 V6, which is capable of 400 hp and 400 lb-ft of torque so we might even see that engine in this too, although none of this is sure yet. Whatever engine gets fitted in there, you can probably expect a sub 6 second 0-60 mph time if competitors and current model are anything to go by, but don’t take our word for it. 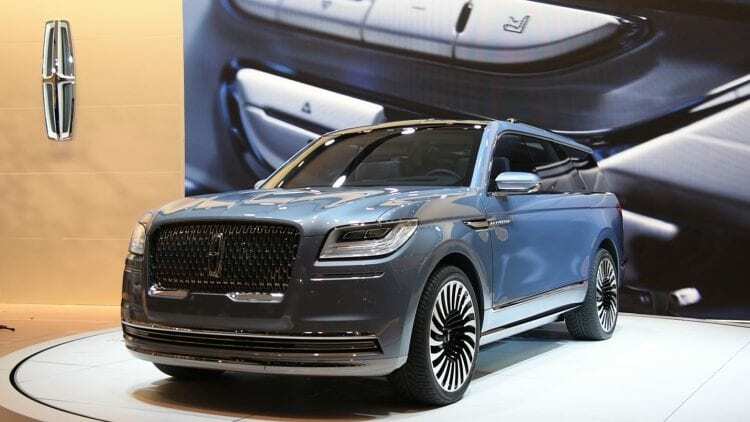 We guess we’ll just have to wait for the official numbers from Lincoln, but suffice to say we’re eager to get the brand new production 2018 Lincoln Navigator Concept for a test drive. Nothing on the suspension front either, so we’ll have to wait and see about that too but the current Navigator has a nice ride, and we might see a similar setup for a new generation. There is quite a bit of body roll, but it’s to be expected with such a massive SUV. It is however very well damped, and it does a great job of absorbing all of the bumps providing a comfortable and pleasant ride. Expect the production vehicle to be scaled back a bit, especially the gullwing doors and the interior features but other than that; we felt like the front, and the back of this concept are mostly production ready. Prices will have to be competitive for Lincoln to sell a lot of cars but we’re optimistic for their future. Currently, available version starts at slightly above $63,000 and with changes we are getting it is safe to assume that prices will go slightly up. I do believe that engine will remain the same. It’s just too early for major changes under the hood.